Founded by local artists in the late 1990s, the 19th edition of annual arts festival Deptford X still draws inspiration from the history and cultural vitality of its south-east London neighbourhood. Current festival director Patrick Henry came to Deptford X three years ago and among previous roles was director of Liverpool’s Open Eye Gallery from 2004-2012. He is, he says, interested in “taking art out of the white cube and placing it in the social and physical landscape of Deptford”. Viewed by Henry as an opportunity both to support emerging artists and to interact with the local community in a significant way, he created a new format for the event, structuring the ten-day festival around a core series of commissions, ‘Platform’. A Special Project and a sprawling and diverse Fringe programme involving 500 artists and 100 projects also feature, all within a 1km radius of Deptford train station. 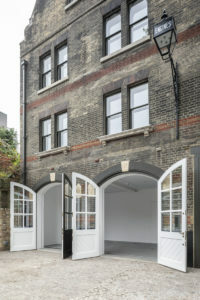 ‘Platform 2018’ showcases the work of five emerging artists – Shawanda Corbett, Georgia Lucas-Going, David Steans, NT and Laura Yuile – selected from a longlist proposed by five art world nominators that included Goldsmiths CCA director Sarah McCrory and artists Larry Achiampong and Oreet Ashery. Over the past months the five artists have received curatorial support and mentorship to develop new works currently on display in a variety of locations in and around the festival hub. Diverse in media and theme, these deeply thought-through pieces embody the artists’ concerns with personal and social histories, readings of the body, and narratives relating to place. 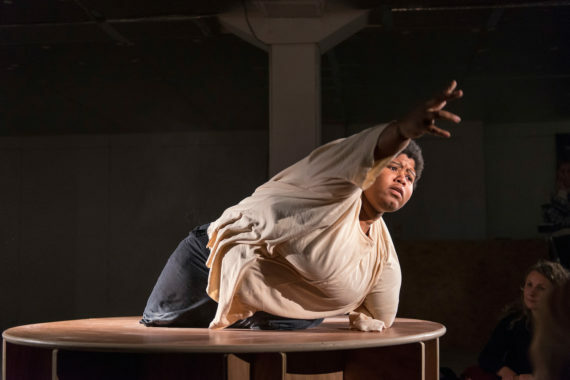 Shawanda Corbett‘s brief but stunning performance, Evocation of Buked, unfolds in a darkened room, with the audience seated on the floor around a circular platform that serves as a stage. The artist considers the experiences of undocumented disabled female slaves by using her differently-abled body, her limited but still incredibly expressive range of motion, as her primary medium. Her dance is a powerful and humbling testament to personal and collective suffering, strength and dignity. 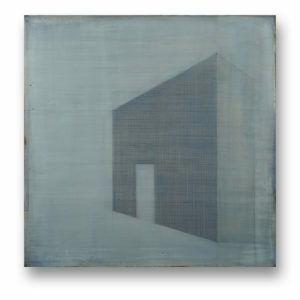 A deceptively simple and unforgettable work. In another dark room NT presents Fox, a two-channel video piece with projections on either side of the space. The work draws parallels between perceptions of ‘urban youth’ and the nocturnal perambulations of urban foxes, both highly adapted to the environment in which they live. 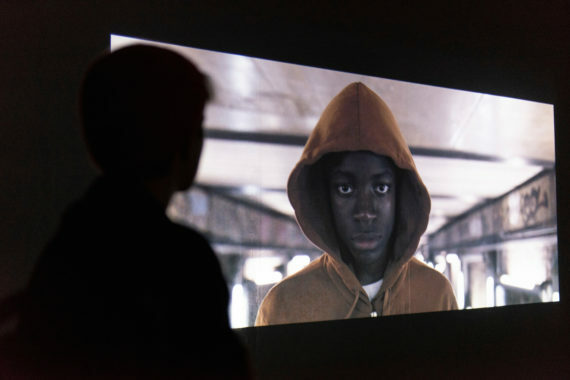 Young male figures are viewed wearing hoodies as they walk, mostly shrouded and anonymous, giving the impression of beings that live in the shadows, somehow in the margins. An immersive soundtrack contributes to this compelling social commentary. 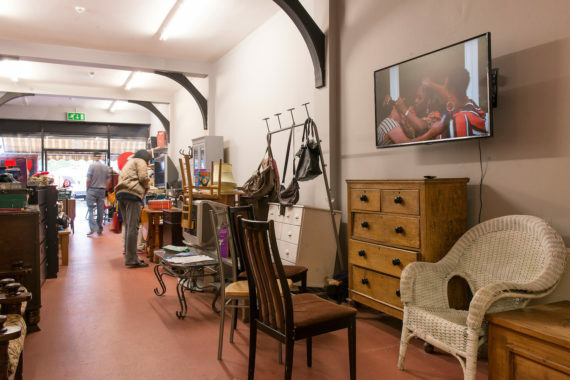 In order to visit Georgia Lucas-Going’s video piece Home is Where the Work Starts 1988 you have to make your way to the back of charity shop Deptford Action Group for the Elderly, where a screen is installed amongst bric-a-brac and stacks of wooden chairs. The artist ‘wanted to dismantle any hierarchies or boundaries that may arise when viewing art in institutions or gentrified areas’ and has selected an accessible and fitting venue for her video piece examining the lives and losses of three generations of women in her family. David Steans has written a book of short horror stories, From the Lounge, for his festival commission. The publication brings together existing works with new texts inspired by Deptford and is available to read in Deptford Lounge. 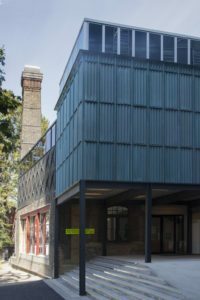 There are also readings by library staff and a performance based on his short story ‘Foul Shot’ that takes place in the uncanny setting of the rooftop ball court. As a site it is unexpected and incongruous, and makes a perfect found theatre for a ghost story. Humour and the absurd are the animating spirits of multi-stranded Special Project, Party Platforms by Louise Ashcroft. 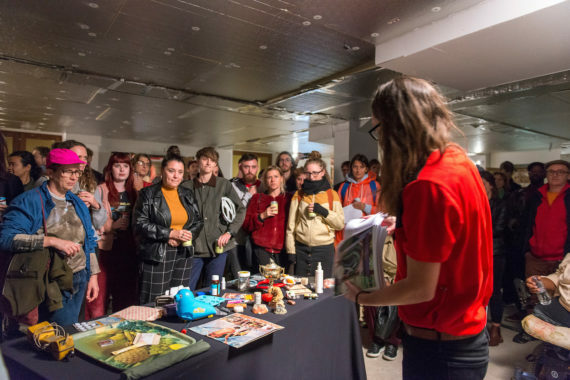 Her improvised performance on the festival’s opening night utilised haphazard objects gleaned from Deptford market, interweaving conjecture with research, jokes about a damaged plastic sea lion toy with thoughts relating to a pack of out-of-date biscuits. The artist was motivated to make a project ‘about how we value uniqueness and peculiarity’, via socially-engaged works that interrogate the inner structure of the festival and its relation to the local terrain. A video piece and exhibition of objects are on view in the festival hub. Alongside the Platform exhibitions is ‘Fringe 2018’ – an uncurated programme of exhibitions and events situated in a variety of settings: galleries such as the Goldsmiths CCA, Deptford Cinema, a wide array of local studios, amongst other sites. Walking from venue to venue, along main roads and down side streets, you encounter the work of a vast array of contemporary artists embedded in the socio-geographical topography of this multicultural neighbourhood. Deptford X 2018 continues until 30 September 2018. www.deptfordx.org.